← Which kind of tools will provide me the function on converting pdf file to jpeg image directly and quickly ? 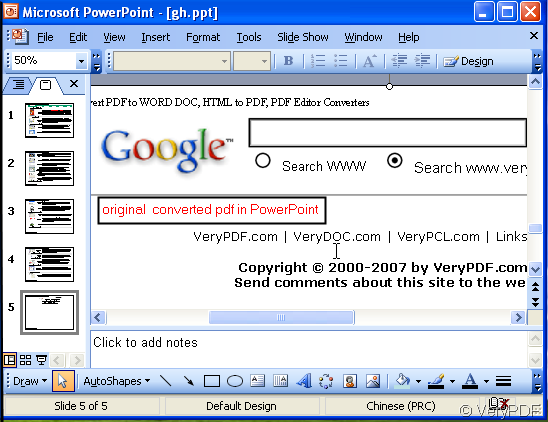 Have you used PDF to PowerPoint Converter? If yes, what does the “Flow text with text boxes” mean? Yes I have used it and I will explain it according to my understanding. 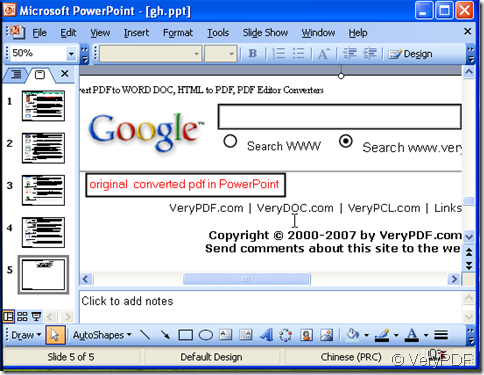 PDF to PowerPoint Converter is mainly used in the convertion from pdf to other forms of documents which can be resaved from PowerPoint, such as mhtml, pot, potm and so on so forth. 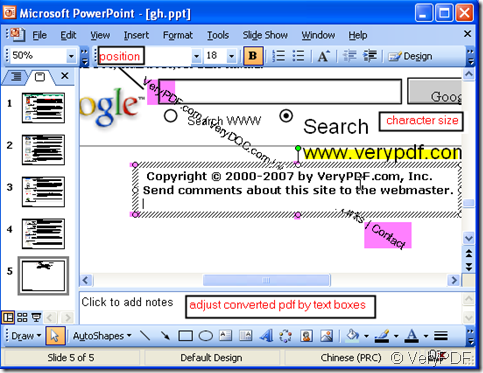 It was developed by VeryPDF whose software products have been widely used in many big companies. 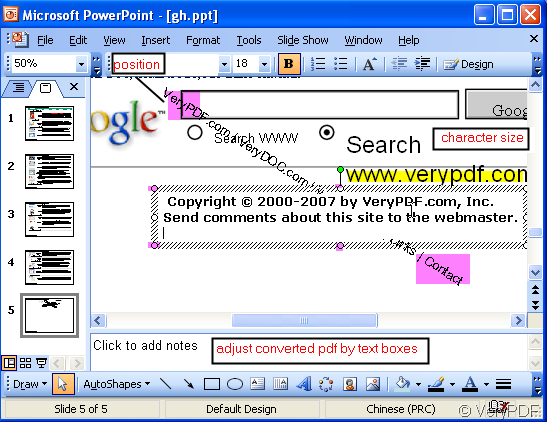 “Flow text with the text” means that converted PDF files to editable PowerPoint presentations, with all the original text, images, graphics, layout and formatting exactly preserved in the converted PPT documents; The text will be around by the text boxes. You can edit it like the other kind of text boxes. You can adjust the character’s size, color and other thing. You can drag the whole text in the box to any part of the PowerPoint. It also can cover on others text. I will show you by pictures. Maybe you can compare “the original converted pdf in the PowerPoint ” file and “the adjusted converted pdf in the PowerPoint ”, then you will have clear understanding of the function of the “Flow text with the text”. This special function is more advantageous for those who want to change the original pdf file style but also want to keep its original content. One thing I need to be pointed out that not all the Office working system can show like this. At first, I used Office 201o but it failed to converted the pdf file. Nothing was shown in the PowerPoint. You’d better use the ones PDF to PowerPoint Converter supports. How to convert documents of Microsoft Office Word to dpx? If I do not have pdf file reader but I want to copy it to my paper, who can help me? I need some contents that are not in the continuous pages of my PDF file, can I convert them once to PPT format? If I want to read the chinese pdf file and add part of them in my PowerPoint, I am an English how should I do? If I want to convert many pdf files to PowerPoint,how should I do? I want to convert my pdf file to PowerPoint,but it has password, how can I make it?